The relief in Charley’s voice was audible, even though the cell phone connection wasn’t crystal clear. I did not detect even an ounce of irony in his voice. Pretty crazy, considering he was calling from Hygeia Hospital in Athens, where he was lying immobilized with a broken femur. On Day 3 of what was supposed to be a weeklong dream vacation in Greece with two cousins, Charley was coming out of a beachside restaurant on the idyllic island of Naxos. He tripped over a curb, fell down, and broke his leg. He was rushed to the closest hospital, a bare bones outfit short on doctors, nurses and painkillers. A harrowing 16 hours later, he was transported to Athens on a medevac flight. Under those circumstances, most people I know (including me) would be distraught. There are just so many negative places the mind could go. Bitterness: This was the trip of a lifetime, and Charley had just gotten started. The vacation itinerary included three more days on the beach in Naxos, then a couple of nights in Mykonos before ending up in a cozy guest house on the outskirts of Athens for the final night of the trip. Anger: I guess it’s not enough that Duchenne destroys every muscle in the body, robbing kids of their ability to walk, lift a toothbrush, and give someone a hug. It also renders the bones brittle and weak, causing severe osteoporosis and frequent fractures. Fear: Will the doctors know what to do? 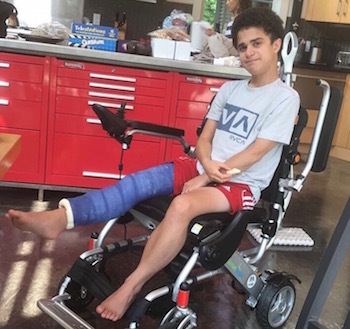 Do they know about the complications that can develop when someone with Duchenne breaks a bone — the potentially fatal complications? Pain: A broken bone hurts like a b—-, no doubt even more when you can’t sleep in your own bed and wrap yourself in your favorite blanket. How could he utter those words and, even more amazing, really mean them? Turns out, Charley’s very good at something many of us try, try, try to master — usually over a lifetime: Be in the moment. For most of us, living this pearl of wisdom is so much easier said than done. But Charley’s a natural. Upon arrival in Athens, he could have pined away for what should have been (six more days of glorious vacation) or freaked out about the future (will I ever walk again?). But instead, he was living in the present, allowing himself to feel whatever passed his way. And at that moment, the predominant feeling was happiness at being in a clean, modern medical facility where doctors could effectively manage his pain. 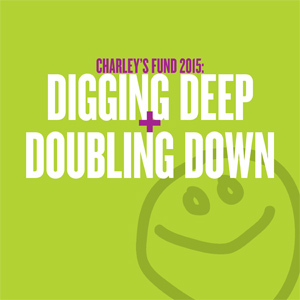 This is not to say that Charley is deluded, or happy all the time. He lets himself feel whatever is genuinely happening at that moment. And sometimes, that feeling is sadness so deep it’s impossible to keep the tears at bay. In the aftermath of the emergency, plenty of those moments came. But they also went. By allowing the feelings to come and go, Charley gets through life on a remarkably even keel despite the enormity and roughness of the waves he is forced to navigate. There are 30,000 books for sale on Amazon.com offering advice on how to be in the present, or “live mindfully.” Clearly, it’s something a lot of us need to work on. I’m not sure how it came to Charley so early and so naturally. He’s not even 18 years old yet and as far as I know, he’s never read a book on the topic. Please don’t get me wrong — I do not mean to claim that he has reached some sort of nirvana, fully living in the present at all times. In fact, just a few minutes ago we almost came to blows because he was driving me so crazy stressing out about the upcoming college application process. So yeah, his mindfulness is definitely not foolproof. But it’s pretty darn impressive, and hopefully gives the rest of us a tiny boost toward a more mindful, present existence.